With our MEMS based sensors we offer flexible, robust and economic solutions for various measurement requirements. Through our proprietary sensor architecutre and the use of modern analysis algorithms we define a new benchmark regarding data analysis technology for stateful maintenance of machines, components and structures. A field of application for our accelerometers “3D ACC” is vibration analyses, frequency analyses in wind power plants (Structural Health Monitoring). Thanks to the efficient data processing using our analysis algorithms and FFT (Fast Fourier Transformation), we offer a long-term real-time supervision of the static dynamic behaviour of components. Our multifunctional sensors provide timely information on condition and wear of components (predictive monitoring) that constitue the basis for stateful maintenance. 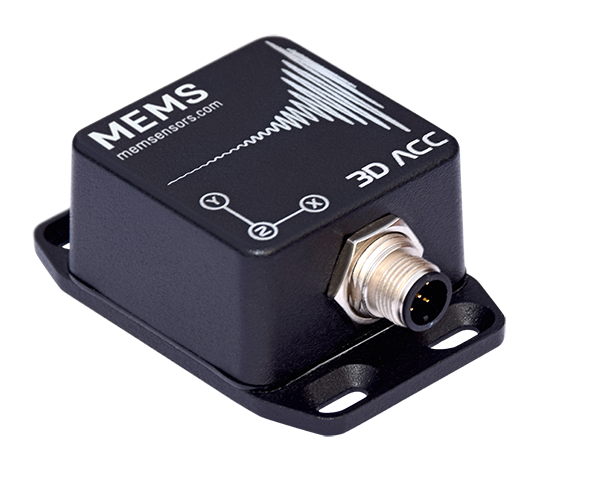 A standalone feature of our sensor “3D ACC” is the low noise in the low frequency range from 0-10 Hz. Compared with sensors on the present technical standard, our product offers high flexibility for an economic price. The individual limit definition and programmability of the sensorics support process optimization and offer a significant reduction of data volume for long-term monitoring and stateful maintenance. Your special comfort is taken for granted. You will obtain our sensors ready-for-use as “plug and play” systems. For you, the installation of the sensor is done in a minute with two grips. We offer a significant process optimization in operation and supervision of the sensors through optional remote maintenance of the systems via a GSM/VPN connection. For tomorrow’s interconnected world, global availability of local measurements will be inevitable. With such data transfer, security becomes a crucial factor. Our systems fullfil both those requirements and at that save money and massively simplify your remote maintenance processes!